Running The Race Before Us: Fight! Finish! Faith! If you and yours are healthy, count yourself blessed! And then I think about how stinkin, undeservedly, blessed I am that the the most trying medical issue that seems to repeatedly pop up in our household is the sinus/ear infection combo. From the article, "Banding together for a fellow teacher." Gina Cook, a preschool teacher for Child’s Play Early Learning Center, was diagnosed with acute lymphocytic leukemia last September. In addition to her profession in education, Cook is a wife and a mother of three children. One of her sons, Josh, 18, decided to organize a 5K run/walk to raise money to support his mom’s battle against leukemia. 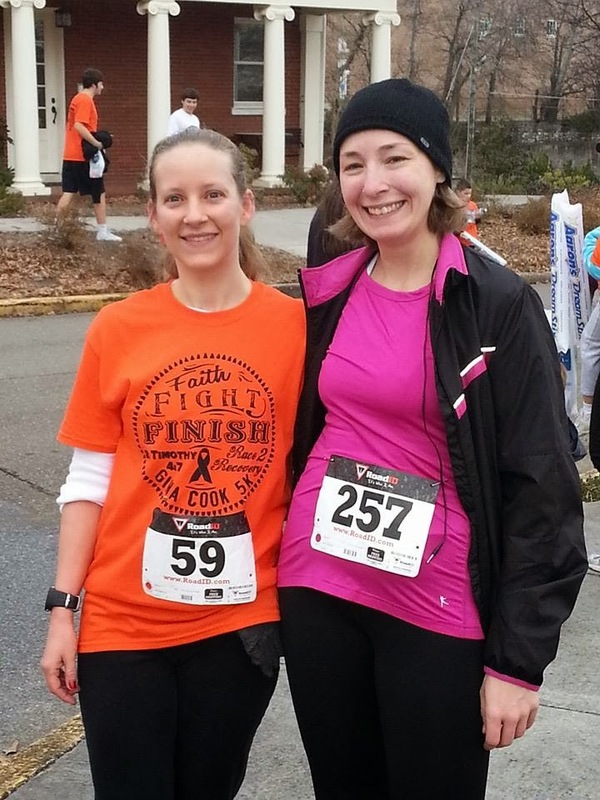 A friend of mine - Hey, Kenyon (insert me waving wildly) - brought the above mentioned 5k to my attention, and I said I would run it if she would (it being a very worthy cause). And guess what, she registered! 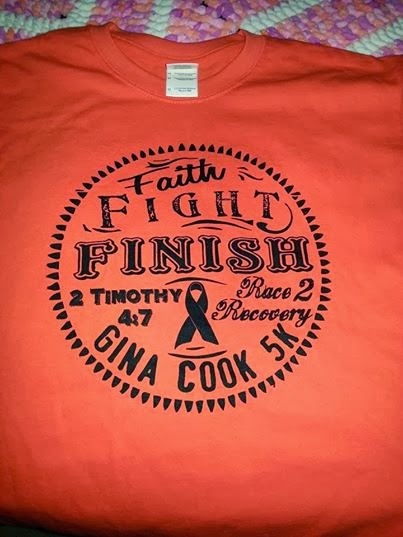 So we ran for Gina Cook! And we finished strong!! It was her first 5k! She did great!! 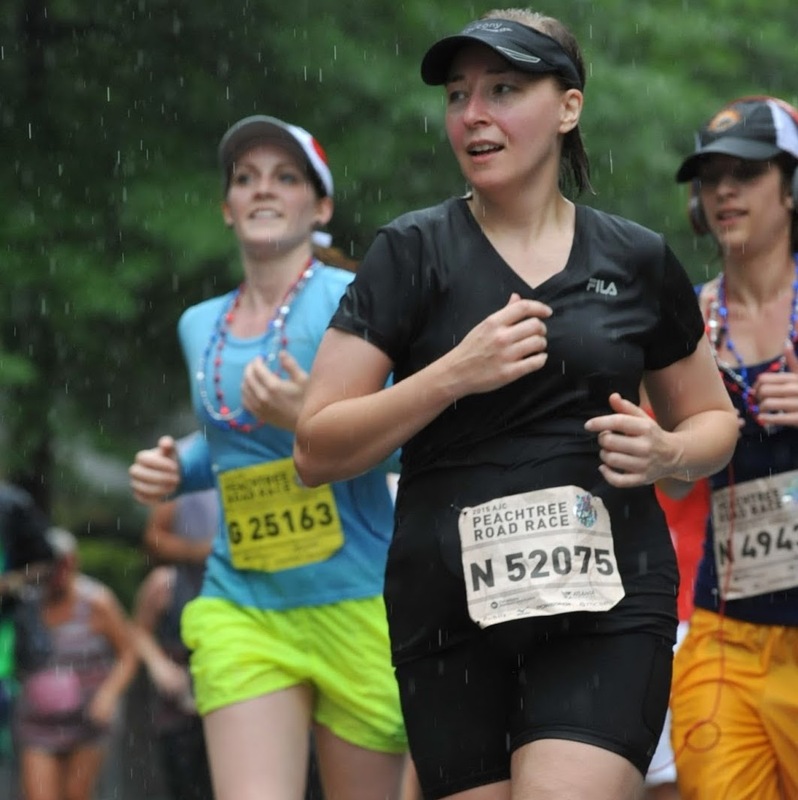 I was very proud of my race time on this one - an estimated 32:15. However, I was more proud that I got to support Gina. I don't personally know her, but I can only imagine the personally hell she must be going through right now. So, I was happy to help out in a small way with my race entry. It's all we can do in this life. Fight! Finish! And always, keep the Faith! Today's forget-me-not: Fight! Finish! Faith! Your blog is wonderful! So great that you are able to share your story with others. I am very sorry for the loss of your Angel and will keep you and your family in my thoughts and prayers. I work for Jewelry Keepsakes, an online retailer that specializes in memorial jewelry. I was wondering if you would have any interest in doing a product critique. We have so many great products that I honestly feel can help parents that have experienced loss. Getting an honest critique not only helps us maintain the integrity of our products and shows us what is working and what we need to improve on but also lets us provide the best products we can to those that are grieving - and that matters most of all. I have a particular fondness for our photo engraved keepsakes as they honor those that are living as well as those that have passed (I have three of each of my children). I would be happy to send at no charge any keepsake of your choice. I just thought I'd check back in about your thoughts on doing a product critique. Please let me know if you have any questions and I'll be happy to answer. Just sent you an idea email Hallie!